The words “I’m moving” are both exciting and daunting. No two homes are exactly alike so furnishings and décor will need to be re-designed in the new space. Mixing existing framed art with new frames will keep important, familiar art a part of your life while creating a fresh design for the new house. Frames can help set a design theme. Maybe the move means out with the old furnishings and in with new pieces. If you have found the perfect frame for your artwork, the rest is easy. 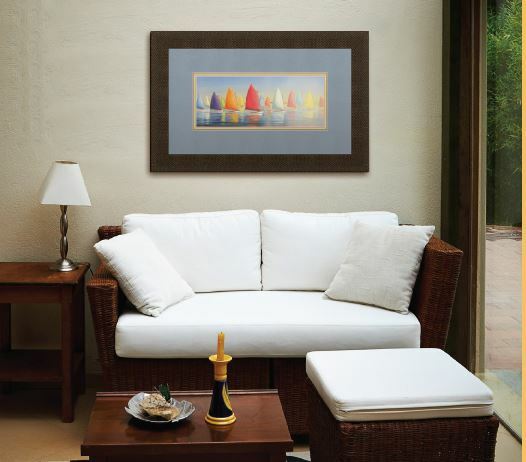 Add neutral colored seating with throw pillows to capture the colors of the framed art. Whether the art is softly colored like the Impressionists or bold like the Modernists, you can build the entire room’s design from the framed art. New frames give walls impact. Perhaps there is a large space that you did not have before. Use the design principles of scale and balance to recycle a single picture from the old house. 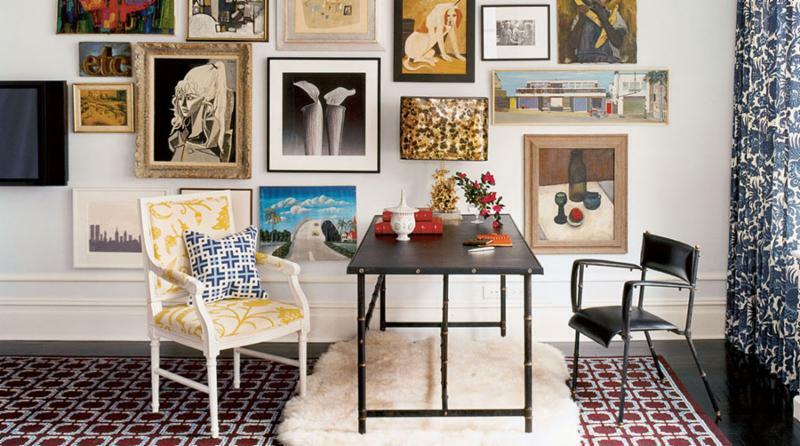 Add one similar sized framed piece to each side to extend the sense of scale with symmetrical balance. Or like the picture add another row! Balance is also achieved by having one larger framed piece with two or three smaller frames to one side. Grouping frames this way creates a strong focal point in the room. Frames of a similar color and texture help establish harmony in a space and those with variety create interesting contrast. Take a look at your artwork and how it is framed. If some of them have gotten a bit dull and “tired”, new frames and matting can bring them back to life. The textures of the frames create a very different look, even when they are of similar color. A heavily carved red stained frame is elegant, formal and more traditional in style; a sleek red frame is clean, light and more contemporary.